Overfishing - catching more fish than the ocean can produce – has been an ongoing challenge for fisheries managers for decades. Today over ¼ of US fish stocks are overfished, which has led to the collapse of some very important fisheries and fishing communities. Of particular note is the loss of one of the largest fisheries in the US, the New England cod fishery. Once the backbone of the New England economy, its collapse, and lack of recovery, continue to adversely impact New England fishing communities. Related to overfishing is the question of how we catch the fish. 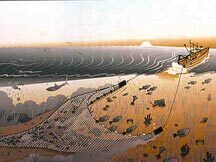 Certain types of fishing methods destroy or damage the very seafloor habitats where fishes and many other seafloor animals reside. Certain fishing methods, such as drift nets or gill nets, are notorious for catching large amounts of bycatch – fish , sea turtles, seabirds and marine mammals - that are unintentionally caught and often incidentally killed in fishing operations. Longlining unintentionally hooks large numbers of seabirds (10,000 to 27,000 in Alaska alone), and also poses a real threat to sea turtles, sharks and mammals, many of which are now either threatened or endangered. Trawling for shrimp results in high rates of bycatch - up to 9 pounds of non-target marine life can be caught for every pound of shrimp- most of which is dumped back into the ocean dead or dying. Although many advances to aquaculture are currently underway, farmed shrimp is not necessarily better at this time. Although there is no bycatch associated with farmed shrimp, thousands of acres of essential mangrove habitat is destroyed each year in developing countries to make shrimp farms. Bottom trawling, a fishing method that drags a large net across the sea floor, is extremely destructive, destroying as it destroys entire seafloor habitats including rare deep sea coral and sponge ecosystems that take decades to millennia to develop. The waters surrounding the Aleutian Islands and the deep-water coral reefs off of Florida are notable examples of habitats that have been severely damaged by bottom trawl fishing. 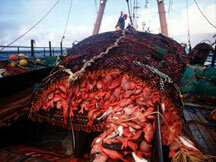 Every year bottom trawling destroys an average of 81.5 tons of corals in Alaskan waters. Catch from a shrimp trawl. Can you find the shimp? 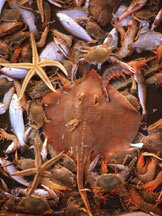 Most of the catch is bycatch.